Sabina is an Associate within our Litigation & Dispute Resolution Team, working closely alongside Partner Darren Bowen specialising in commercial property disputes. Sabina is originally from Sweden, where she attended the Scandinavian Aviation Academy and gained a Commercial Pilot License at the age of 18. She obtained her law degree at the University of East Anglia and completed the Legal Practice Course in Cambridge with a distinction. 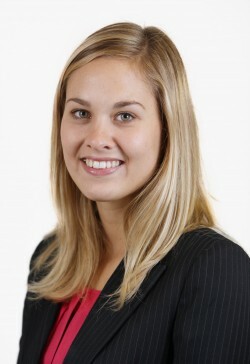 Sabina trained with Leathes Prior, qualifying into the Litigation & Dispute Resolution Team in October 2013 and promoted to Associate in May 2018. Sabina specialises primarily in commercial property disputes including lease renewals, forfeiture, rent arrears and dilapidations. Sabina frequently acts for corporate landlords, tenants and developers. Sabina also assists the team with residential property disputes and probate claims. Many thanks for the excellent work you have done in resolving our recent tenancy issue. It was conducted in a very professional manner, plus your advice on the problem was first class. I would have no hesitation in recommending you or Leathes Prior Solicitors to anyone. Thanks again for all your assistance with this matter. In my opinion you have done an excellent job and it’s no doubt that your diligence has assisted us in achieving this result. I would just like to say that you have over the past three years on this matter looked after me exceptionally well. Thank you. Readily available and always helpful. I would like to take this opportunity to thank you for your help in reaching a settlement with [a timeshare company]. The service you provided was excellent in understanding my problems and responding so quickly, without your help I think the case could have gone against me… if I ever need a solicitor in the future I can assure you I will be in contact with you. Sabina Haag is a rising star. The fact that the matter was conducted in a very low-key manner causing little anxiety to me is a testament to your handing of the affair. Many thanks for all your efforts on my behalf, I am truly grateful. I was pleased with the competent and efficient service and attention to detail shown. It’s such a relief to have our house back. I can’t thank you enough for all the support and guidance you have given us. Many thanks for your prompt attention and advice regarding our timeshare dilemma; it is much appreciated for peace of mind!